A triple layer of baby girl gifts takes the cake in newborn essentials. New parents will very much welcome this whimsical cake made of disposable diapers, a hooded terry towel, washcloths and many other everyday baby care necessities. “Frosted” in pink hues, the gifts are stacked in a layer cake form and attractively wrapped in tulle. Measures 15”H x 15”W x 19”L Arrives as pictured. Blanket,1 Terry Lined Changing Pad,1 Multi-color Bear. 1 Hooded Terry Towel, 1 Hat, 1 Pair Booties, 4 Washcloths, 1 Brush & Comb Set, 1 Rattle, 1 Multi-color Bear. 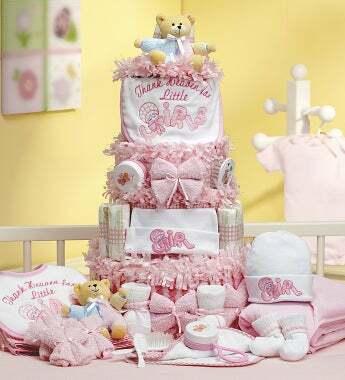 A triple layer of baby girl gifts takes the cake in newborn essentials. New parents will very much welcome this whimsical cake made of disposable diapers, a hooded terry towel, washcloths and many other everyday baby care necessities.